An incredibly agile 16’ low-side, the Eddy sneaks through tight spots with ease even when fully loaded. Quick enough for the Beaverhead yet stable enough for the Yellowstone, the Eddy is ideally suited for a wide variety of rivers and situations. 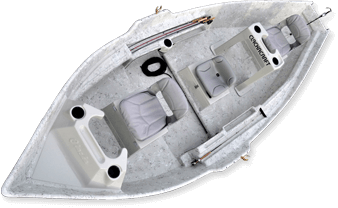 Gone are the days of sacrificing row-ability for maneuverability. Go ahead, let the big guy sit in back, bolt on the motor; the Eddy can handle it.